With the USB port at the bottom, stick Circuit Playground to the back of your screen, facing the wall behind. Blue poster-tack or double-stick foam tape can work…or sometimes even regular clear sticky tape across the face of the board. But DO NOT stick Circuit Playground directly on the back of a metal-bodied device, like an aluminum MacBook, or you’ll get an electrical short…cover the back of the board or use a mounting method that leaves a little space between board and screen. NEVER stick Circuit Playground directly on a metal computer. There should be an air gap, or tape an index card between the screen and board. The Processing sketch clones the contents of your screen and sends this data to the Circuit Playground, which then updates the LEDs. Try moving windows around, or play a movie or a game. 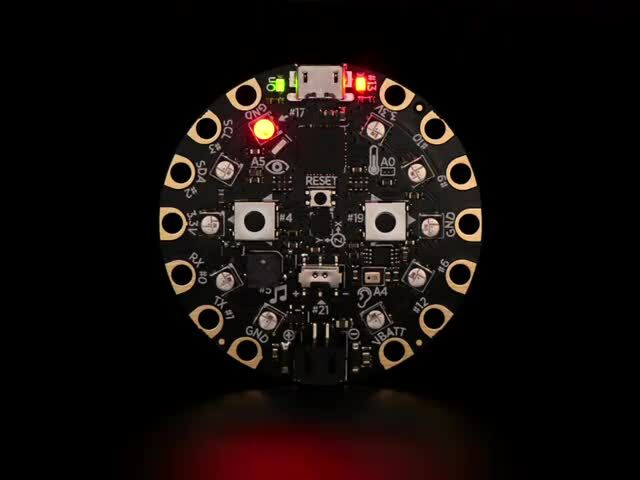 Ten of those squares correspond to the ten NeoPixels on the Circuit Playground board. It’s not all one color…you can actually see motion reflected in the LEDs. There are compatible third-party apps that may work better with full-screen video. The original Adalight guide mentions a couple of options (Lightpack and Boblight) that may fare better in this regard, though they’ll require some initial set-up to define the pixel placement as described above. This guide was first published on Jan 12, 2017. It was last updated on Jan 12, 2017. This page (What It Does) was last updated on Mar 26, 2019.